One of the reasons that Oregon suffragists achieved victory in 1912 is that they tailored their message for various groups of male voters across the state. Members of the Portland Branch of the College Equal Suffrage League not only tailored their message for men who worked in shops and factories. They also took the suffrage message directly to the places where men worked and at a time convenient for them to listen. Working men might not be able to attend evening meetings on suffrage topics; noon meetings at their own shops during lunch hour were a great way to reach them. 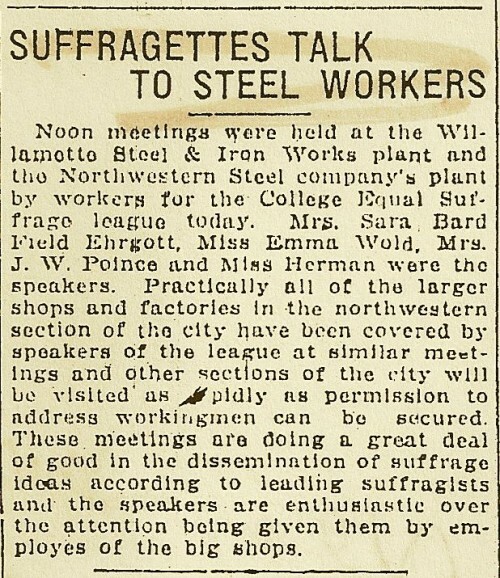 “Suffragettes Talk to Steel Workers,” Oregon Journal, August 8, 1912, 10. Getting the suffrage message out to as many male voters as possible was crucial. College Equal Suffrage League members went directly to the shop floors and asked workingmen to listen to their arguments as they ate their sandwiches at noon hour. Perhaps it was not only the message, but the women’s willingness to make the trip, that made these noon meetings so effective.